First, a method helps you focus. A method offers you a pattern to come back to when your attention wanders. Having a structure is a bit like having an agenda for a meeting, or a grocery list for a trip to the market. 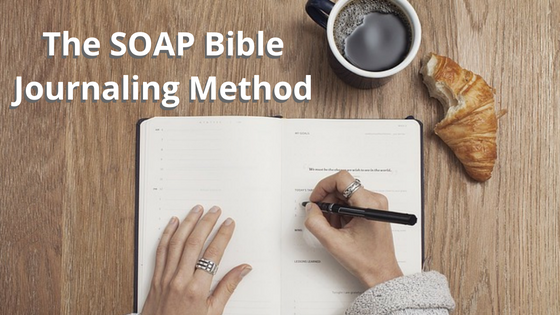 A method helps you set and keep an intention for your time with God. Second, a method creates greater faithfulness. I just listened to an interview with a psychologist whose research revealed that when people have a ritual around an activity it can help them complete the activity even when it’s difficult. Let’s face it — sometimes bible study is hard work and you aren’t excited about it. In those moments, a method can get you over the hump of resistance. Third, methods broaden your experience of God. People report to me that one of their devotional struggles is that they tend to fall into just thanking God or only asking God for things. A healthy bible study and prayer life will be well-rounded. Read a passage and write down a verse or two that stands out for you. Following a bible reading plan will help you be more consistent and you won’t waste time trying to figure out what to read. That’s just one more simple reason to not get around to reading. One of the downloads I have prepared, “The One Year Bible Reading Guide” offers multiple plans for you to choose from. Initial Impressions. These notes don’t even have to be full sentences. Just bullet point observations upon your first reading of the passage. What would this passage have meant for the original audience? This question pushes you to think about the context of the passage. It pushes you to explore the biblical world more deeply. Most misunderstanding and misapplication of text is rooted in failing to consider the context. God calls us through his Word to grow as disciples. If you have identified in a passage a principle, task, or change, then ask yourself how it personally applies to you. In my own journaling practice I found one of the simplest and most effect ways to do this was to complete the sentence. “Right now I believe God wants me to….” Complete that sentence with the action you need to take to apply the scripture. This will sound cliché’ but it is so true – This is a life changing approach to praying and reading God’s Word. The journaling method I followed in college was very similar and it complete transformed me. What I didn’t realize is that every day when I completed the sentence, “Write now I believe God wants me to…”, I was setting a miniature spiritual goal (http://thepracticaldisciple.com/bible-study-and-application-setting-spiritual-goals/) . So ever day I was taking micro-steps toward being a more faithful disciple. In my own journaling process, I also always completed the sentence “One thing I don’t understand is…” Or, sometimes I would include at the end, “Questions I have about the text are:” The practice of completing this sentence or recording questions pushed me to find the edge of my own understanding. I have no doubt that it also dramatically accelerated my learning and growth. It did so because it created a conscious vacuum of knowledge that I then wanted to fill. The questions I had about the text were now consciously before me. God would often answer those questions in future reading. In short, I learned more because I was primed to look for more. A secondary benefit of recording your lack of understanding is that it keeps you humble. I have seen a lot of people leap into bible study and become very arrogant as they learn. They begin to feel that they know much more than others. The more they feel this way the less they have a teachable Spirit. They also can become unknowingly condescending and quench the Spirit of others striving to grow. With that said, I cannot encourage you enough to stay humble by recording the holes in your understanding or list the questions you still have when you are reading God’s Word. It’s okay to keep your answers short. You don’t have to write a prolific essay for every answer to be meaningful. In fact, my experience has been that the newbies who right lengthy entries when they start out full of excitement, often flame out early. Many times I don’t even write things in complete sentences. Particularly, when I am just capturing observations. Thanks John I will apply this to my daily bible study. I do something similar but this is more organized. He Patty, Thanks for commenting. Let me know how it goes. My kids are 9, 5, 3 and 1. Power struggles are my middle names. One would think by now I’d be some kind of expert in this field but alas, no. It’s definitely about picking your battles. If I did8&#n217;t I’d have been sectioned a long time ago.